The River Camel rises on Hendraburnick Down on the edge of Bodmin Moor and flows through the Camel Valley for 30 miles before entering the Celtic Sea area of the Atlantic Ocean between Stepper Point and Pentire Point. The river has four main tributaries the River Ruthern, the De Lank River, the River Allen and the River Stannon and together they drain a great deal of North Cornwall. Camel is a Cornish word meaning “the crooked one” named recently after the rivers winding course, the river was originally divided into three named stretches. The River Camel is tidal as far up as Wadebridge and Egloshayle and is an excellent for bird watching and fishing. The River Camel’s estuary stretching from Wadebridge to the open sea at Padstow Bay is known as the Camel Estuary and offers a wide range of water sports such as sailing, water skiing, windsurfing, surfing and kite surfing. 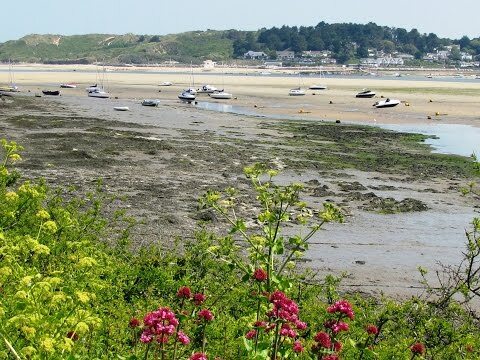 The estuary between Padstow, Rock and Wadebridge is only a small area of Cornwall’s designated Area of Outstanding Natural Beauty and there are five Sites of Special Scientific Interest along the length of the River Camel. The river has also been designated by the Joint Nature Conservation Committee as a Special Area of Conservation as being of European importance for the Otter and the Bullhead. With the large areas of salt marsh on the estuary the River Camel provides an excellent location for large flocks of waders, Mute Swans, Shelduck, Shoveller and Mallard and further upstream Teal. There are Peregrines in the area and a migrant Osprey is often seen in the spring and autumn stopping off for a few days to feed on the fish. The Camel Estuary was one of the first places to be colonised by Little Egrets mainly seen in the mudflats at low tide. The estuary is also a Sea Bass conservation area and further up river Flounders, Salmon and Sea Trout can be found. Basking Sharks and bottlenose dolphins can sometimes be seen in the mouth of the river. Padstow a town and fishing port situated on the west bank of the River Camel estuary has become a very popular tourist destination and yachting haven with only some of its former fishing fleet still working. In the mid 19th century ships carrying timber from Canada would arrive at Padstow and offer cheap travel to passengers wishing to emigrate. Ferries have crossed the Camel estuary for centuries and today the Black Tor Ferry carries pedestrians between Padstow and Rock daily. The South West Coast Path, which runs on both sides of the River Camel estuary, crosses from Padstow to Rock via the ferry. The Coast Path is England’s longest long distance footpath and a designated National Trail mainly funded by Natural England and maintained by a dedicated South West Coast Path Team. It stretches for 630 miles from Minehead in Somerset, along the coasts of Devon and Cornwall to Poole Harbour in Dorset. The path was originally for the coastguards to be able to walk from lighthouse to lighthouse patrolling for smugglers hence the path runs close to the coastal edges so that they could look down into every bay and cove. Another long distance footpath The Saints’ Way runs from Padstow to Fowey on the south coast of Cornwall. The main attraction to Padstow is the celebrity chef Rick Stein. He owns four restaurants, cafe, deli, patisserie, fish and chip shop, fishmongers, gift shop, the seafood school and has many self catering cottages and properties. Padstow is also best known for its ‘“Obby ‘Oss” festival which starts at midnight on May Eve and finishes in the late evening. We park in the car park at Lower Halwyn and walk up the steps onto the Camel Trail and turn left for Padstow. We follow the track crossing over the iron bridge over Little Petherick Creek for 1½ miles. On entering Padstow we walk across the Harbour car park and past Rick Stein’s wet fish shop and deli on the left. We then walk at the side of the harbour to the Tourist Information Centre and take the South West Coast Path on the left uphill. The path leads us across an open grass field with wonderful views of the estuary to the War Memorial. We keep heading forwards past the War Memorial and follow the coast path round St George’s Cove and past Gun Point. The views of Padstow Bay and the white sandy beaches are stunning. We bear left following the hedge on our right for a very short way then go over the stile in the hedge into another field. We keep heading round the edge of the field until we come to a track where we turn left. We follow the track to Tregirls Farm, turn right and immediately left and follow the tarmac track for just under ½ mile. When we get to the double yellow lines we turn left at the footpath sign and follow the track through the field until we arrive back at the War Memorial. We now retrace our steps down into Padstow and follow the Camel Trail back to the car park. The Camel Train is flat easy walking and the walk north of Padstow is on paths and tracks that are in places a little uneven. Elevation: Lowest point approx -0.31m (0.98ft) highest point approx 68m (222ft). Approx 7.5 miles allow 3hours using OS map 106 Newquay and Padstow. Start Point: Lower Halwyn free car park at the side of the Camel Trail near Padstow. Padstow is situated on the banks of the River Camel Estuary in North Cornwall in the South West of England. From the M5 take junction 31 and merge onto the A30 towards Bodmin and Okehampton then take the A395 at a roundabout towards Hallworthy and Camelford. At the t-junction turn left onto the A39 towards Wadebridge. After passing Wadebridge take a left turn onto the A389 at Hal’s Grave. On reaching Trevance take the first right and follow the minor road to a t-junction at Trevilgus Farm on the right. Turn right and then first left and follow the single track road until you reach the free car park just below the Camel Trail at Lower Halwyn. There are four main car parks in Padstow and the public toilets are in the Harbour car park. For refreshments there are ample shops, cafes, tearooms, bakeries, take-away, pubs and restaurants.